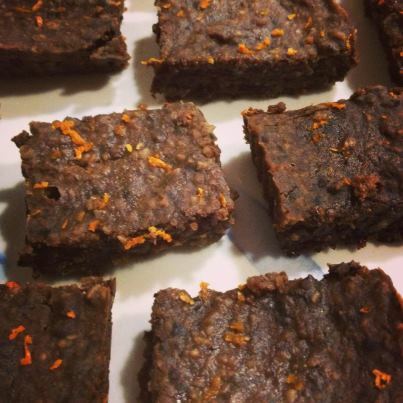 This brownie recipe was one I made for the first time this evening, and brought to a dinner with 3 kids who do not particularly love healthy food. These brownies were a HUGE hit! Healthy and delicious…try em out! In a blender combine all ingredients (except for chocolate chips). Pour mixture into a greased 8×8 baking pan and bake for 20-25 minutes, rotating 1/2 way through. After removing from the oven drizzle honey and orange zest onto the top of the brownies. Let sit for 10 minutes before cutting into pieces. Enjoy!